As the novel commences in the late 1990s, we're introduced to the workplace by way of a collective recollection of headier times … While the We voice contributes to the book's strangely compelling vibe, it also presents challenges. Occasionally, the narrative suffers from too many anecdotes that begin along the lines of, We heard such and such from so and so who heard it from . . . And in the first sections, the collective We represents such a large, diverse group that it's difficult to feel emotionally vested. But this is only because Ferris does not cheat, and his discipline pays off nicely in the end … Ferris skillfully balances the comic with the authentic, the insightful with the absurd, and we can't help but be transfixed by their stories. 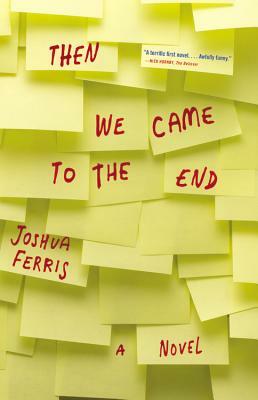 Then We Came to the End is full of such brilliant miniature treatises — on the experience of time (‘We had visceral, rich memories of dull, interminable hours’), the hierarchies of complaint, the meaning of lunch — all heartfelt and delivered in solemn deadpan, constituting a veritable poetics of the office. The novel is narrated primarily in the first-person plural — not the noble, empowered We the People, but the we-the-undifferentiated masses … What looks at first glance like a sweet-tempered satire of workplace culture is revealed upon closer inspection to be a very serious novel about, well, America. It may even be, in its own modest way, a great American novel. What did you think of Then We Came to the End?